Pat Fiorello is a professional artist who aims to capture the beauty and energy of nature in her paintings. Known for her romantic paintings of landscapes, gardens and florals, she paints in both oils and watercolor. 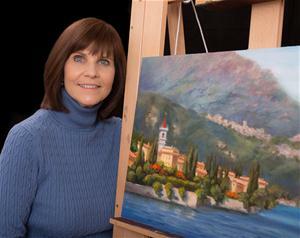 Pat shares," As an artist, I have 3 primary intentions: to inspire and uplift others, to continue the lifelong process of developing and growing as an artist and to create paintings that are exquisite, elegant and luscious ".